HÀ NỘI — The Việt Nam Posts and Telecommunications Group (VNPT) and the Việt Nam Mobile Telecom Services Corporation (Mobifone) have prepared full dossiers to be transferred to the Committee for State Capital Management (CMSC) this year. The information was released at a meeting between leaders of CMSC and the Ministry of Information and Communication (MIC), which is currently managing the two telecom giants, in Hà Nội on Thursday. A MIC representative said that VNPT and Mobifone were finishing financial reports, which were expected to be completed before October 31 this year – the deadline for the transfer. 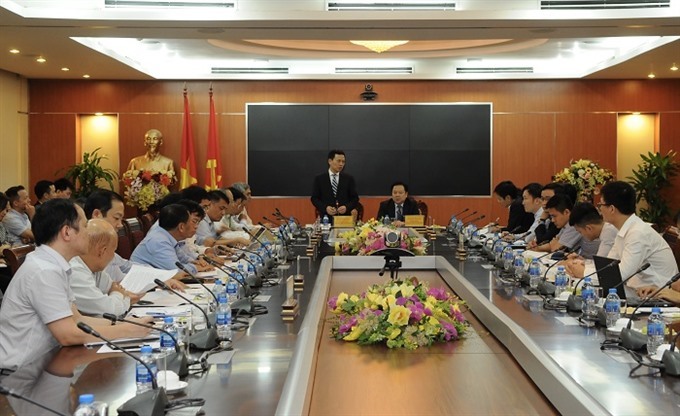 At the meeting, Chairman of CMSC Nguyễn Hoàng Anh emphasised the importance of this meeting before the transfer, creating effective co-ordination between the ministry and committee. “The committee is actively meeting every enterprise and wants to listen to their opinions and aspirations in order to set up plans and methods, avoiding the disturbance in every business,” said Anh. He said that the transfer must be completed in November. Therefore, the committee expects the MIC to continue supporting it to complete the work. According to Minister of MIC Nguyễn Mạnh Hùng, VNPT and Mobifone are giant businesses in the telecommunication industry. The ministry hopes that the CMSC will create competitive advantages and new development steps for them. VNPT and Mobifone are two of 19 State-owned economic groups and corporations to be transferred to and managed by the CMSC this year. According to consolidated financial statements as of December 31, 2017, the total value of State equity at these 19 groups and corporations reached more than VNĐ1quadrillion (US$43 billion) and the total value of assets was VNĐ2.3 quadrillion. The CMSC is responsible for managing State capital at the enterprises where the State holds a 100 per cent stake and at joint stock companies and limited liability companies with multiple members where the State has invested its capital. The committee, established by the Government, has one chairman and at most four vice chairmen appointed or dismissed by the Prime Minister. The aforementioned 19 enterprises are run by five ministries.